Situated just off the main road through the village and close to the amenities and footpath which leads through the dunes to the sandy, surfing beach of Croyde. 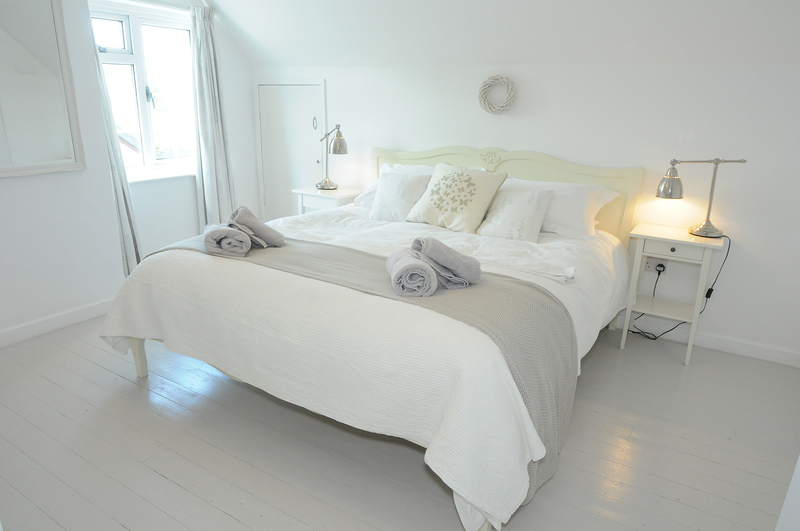 Bay Cottage has proved to be one of our most popular holiday cottages with many guests returning year after year. Wash off the sand and seawater in the outside shower before heading indoors to the very comfortable accommodation! To the ground floor there is a double bedroom with king size bed, twin bedroom with black out blinds and a family bathroom with modern white suite fitted and shower over the bath. Large sitting room with original feature fireplace and well equipped with plenty of toys to keep the children entertained! Flat screen TV with freeview, DVD player and a selection of childrens dvd's are provided. The kitchen/dining room easily accommodates 8 people and is well catered and with the added bonus of plastic plates and cups etc for children. Baking equipment is also provided to keep you busy on rainy days. You will also find picnic baskets to use so you can enjoy a family picnic on the beach! The kitchen leads out onto the rear gravelled garden where there are table and chairs and coal BBQ provided for outside entertaining. To the first floor is a lovely master bedroom with super king size bed and contemporary en-suite shower room and a further twin bedroom. Outside there is driveway suitable for parking 2/3 cars and it is just a short walk to the village and footpath leading to the beach. This property provides free super-fast fibre broadband. Thank you so much for providing a wonderful home from home setting for our week in Croyde! We have absolutely loved the house and Croyde and will definitely come again! Weather has been lovely with just a couple of slightly chillier days but we have so enjoyed being mainly in Croyde with lovely cafes/shops and the family loved surfing! Beach is gorgeous! Check-in time is from 4pm and check-out time is at 10am.